The play in nine acts "Futatsu Chôchô Kuruwa Nikki" was originally written for the puppets theater and performed for the first time in the 7th lunar month of 1749 at the Takemotoza in Ôsaka. It was adapted for Kabuki a few weeks later by the zamoto Arashi San'emon IV in the 8th lunar month of 1749 in Kyôto. The roles of the 2 sumô wrestlers Nuregami Chôgorô and Chôkichi were played by the actors Nakayama Shinkurô I and Fujikawa Heikurô. The "Hashimoto" act is the 6th act of the play "Futatsu Chôchô Kuruwa Nikki". 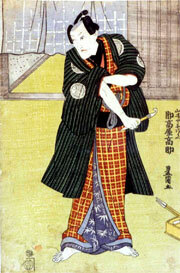 It is rarely revived nowadays but it is still in the Kabuki repertoire. 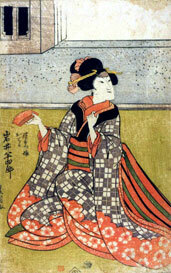 Oteru, Yogorô's deserted wife, now lives in the house of her father, Hashimoto Jibuemon, in the town of Hashimoto near Kyôto. To this house Yogorô and Azuma come in a palanquin carried by Jinbei and Tasuke. Tasuke goes away but Jinbei remains outside the house. Yogorô, entering the house, asks Oteru to let him and Azuma stay in the house. Oteru agrees to keep Azuma but advises Yogorô to return to his own house. Overhearing their talks, Jibuemon comes out of an inner room to tell Yogorô that he is willing to keep Yogorô in his house on condition that he writes a letter announcing his divorce of Oteru. When Yogorô writes it Azuma proposes to keep it to herself because she feels sorry for Oteru. 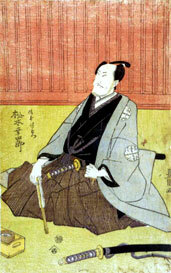 Yamazaki Yojibê, Yogorô's father, visits the house and asks to let him take Oteru to his house. Jibuemon declines saying he cannot let her live with such a wretched man as Yojibei. Their quarrel develops into a fight with drawn swords. Jinbei, one of the kagokaki, enters the house and proposes to persuade Azuma to give up Yogorô because their love affair is the cause of all troubles. Yojibei and Jibuemon agree and withdraw to an inner room. Jinbei tells Azuma he is her father, adding that he had to abandon her when she was six years old because of his failure in business. He makes an earnest appeal to Azuma to give up Yogorô. As she cannot comply with his request, however, she attempts to kill herself when Jibuemon reappears and proposes to pay the remaining sum of her ransom by selling his sword. Yojibei reappears with his shaved head and wearing a Buddhist priest's robe, saying that he has entered the Buddhist priesthood in order to atone for his son's misconduct. He proposes to keep Oteru and Azuma respectively as Yogorô's wife and mistress. All agree to this and Yojibei takes Yogorô, Oteru and Azuma to his house.